I want to experience uncrowded beaches in California, when the only hazard might be a sloth of grizzlies feeding off a whale’s washed-up carcass. I’d like to regard old growth redwood forests, when they weren’t yet old, and certainly not pockmarked by logging. I’d like to see skies blackened by birdlife, including a condo of condors. I want to see 10 pound smelt and 60 pound salmon swimming our creeks and rivers. 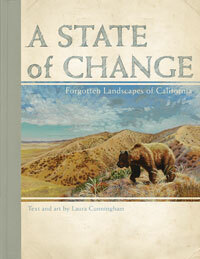 If you too want to travel back in time, then A State of Change, Forgotten Landscapes of California by Laura Cunningham is the sweetest prehistoric treat you’ll ever find. Laura Cunningham presents a California from the good old days. A State of Change considers both the hedge nettle (described as a “very leafy sweet marjoram” in Fray Crespi’s diary from his overland exploration to 55° north with Pedro Fages in 1772) and both acorn and buckeye pestled by natives as a dietary staple. A State of Change informs us of grizzlies too. “All of this abundance of food may also explain why grizzlies in California did not hibernate like their Rocky Mountain cousins,” writes Laura. I leave it to you readers to pursue locating Laura Cunningham’s book and examine its contents further. A State of Change covers a range of prehistoric and historic flora and fauna. Also check its sources: the Bibliography runs from page 319 to 343 in a dense 6 pt. font. A State of Change is a Heyday book. A website dedicated to the book is located here. A preview of this beautifully illustrated work is found on Google books. If William Brewer were alive today he’d dig your blog, Tom! Very cool! Thank you for letting me know of it. This looks fantastic…I may need to get it. 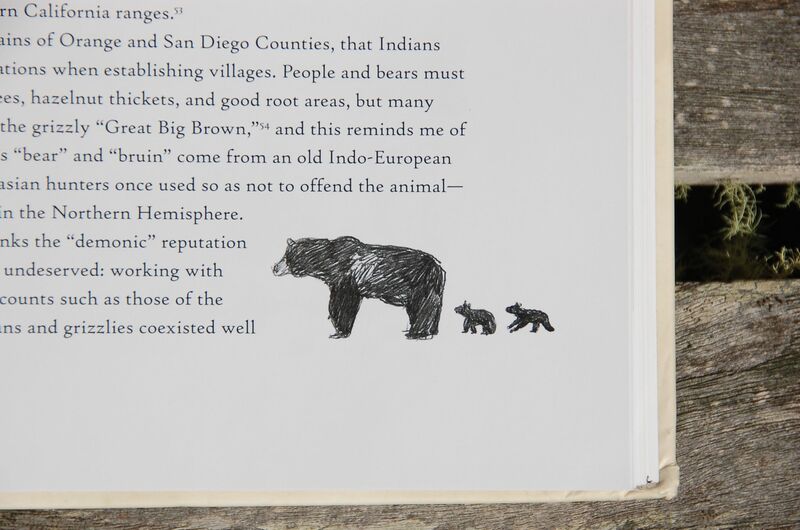 My fascination with the “forgotten landscapes of California” is what got me reading William Brewer. I’m currently posting Brewer’s letters in real time (+150 years), accompanied by present-day photos of the places he describes–a much less rigorous project than Cunningham’s, but in a similar spirit.